Exceptional Quality, Inspired by the Principles of Sacred Geometry, this unique Jewelry collection is as Powerful & Beautiful as they come! 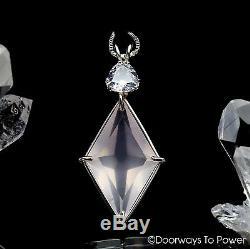 Rose Quartz Ascension Star Pendant w/ Danburite (Synergy 12 Stone). This beautiful cut resembles a four pointed star or cross. The energy of the cut empowers us in our individual ascension process. It aids in bringing in the energy of the Divine and assists us in more fully manifesting our higher self. Another fine feature of this cut is the stimulation of alignment with the highest guidance that we are capable of receiving so that we may more fully participate in conscious evolution. Included : Comes complete with 18 inch. 925 Sterling Silver chain in its own velvet jewelry box. This beautiful Ascension Star cut resembles a four pointed star or cross. KEYS - Love, Gentleness, emotional Healing, release of stress, uniting with divine love. Rose Quartz is the stone of universal love. It restores trust and harmony in relationships, encouraging unconditional love. Rose Quartz purifies and opens the heart at all levels to promote love, self-love, friendship, deep inner healing and feelings of peace. Calming and reassuring, it helps to comfort in times of grief. In the psychic and spiritual realms, rose quartz is often used to attract love, and for love spells. It is also used to ease the process of transition in dying. Rose quartz can be helpful for dream recall and dream work. Keys Angelic Communication, Channeling, Inter dimensional Travel, Peace, Freedom from Stress Chakras Heart (3rd) Crown (7th) Soul Star (8th). 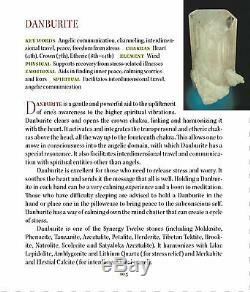 Danburite is a very hard stone with a vitreous luster. The metaphysical community prizes Danburite for its ability to connect the bearer to sources directly to sources of Higher Wisdom and to vast libraries of information located in the "akashic records". "Akasha, " in Sanskrit, means "brilliant, " "shining" or luminous.
" "Akashic records is a theosophical term referring to a universal library of light which records every thought, word, and action, past, present and future, and the templates for all structures and processes in the material world. These records are impressed on a subtle substance called akasha or Soniferous Ether. My relationship with the stones of the earth began over 30 years ago. As a child I started collecting rocks I would find on hikes in the mountains and deserts. I have always felt a deep connection to the love in the earth through the stones, the plants, the trees, the wind, the animals. All of nature is a beckoning call to my soul. This has led me upon the path of health and healing and I now hold over 3,000 hours in education, certifications and national licenses in fields ranging from nationally certified professional bodywork therapist to mastery in energy healing in various modalities, shamanic work, astrology and countless others including master herbalist and clinical nutritionist. I have been collecting and utilizing stones and crystals (from all over the world and my travels) in my work all the while, and have developed a special connection to these beautiful gifts from nature. You will hear the call in your heart when you see and feel the one that is meant to be a key to your awareness, a doorway to your inner power. Dispatch Times - We normally dispatch your order within 24 hours (Mon-Fri). Note: All BOOKS are FINAL Sale. We take as many photos as possible to provide an accurate description of item. The item "Rose Quartz & Danburite Crystal Ascension Star Pendant. 925 SS Synergy 12 Stone" is in sale since Thursday, March 21, 2019. This item is in the category "Everything Else\Metaphysical\Crystal Healing\Pendant". The seller is "doorwaystopower" and is located in San Diego, California.